The tribal name, Chickahominy, translates to "coarse-ground corn people," and indeed their language contributed the word "hominy" to English. Recent high-tech examination of Chickahominy artifacts extracted decades ago by the late William & Mary archaeologist Norm Barka not only shows that the name is perfectly apt, but also suggests that corn may have been a major reason for the tribe's curious autonomy in a region that was otherwise under the absolute control of Wahunsunacock, better known today as Powhatan, the father of Pocahontas. "What history doesn't tell us—and in this case it doesn't tell us much—we have to get out of the ground," says Martin Gallivan, a professor in the Department of Anthropology. A collaboration among researchers and the Chickahominy has made good use of the ancient relics Barka brought out of the ground from 1968 to 1972 . 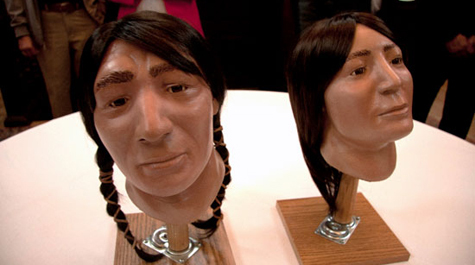 Modern science applied to the relics has revealed intriguing details of the lifestyle of the tribe before the Colonial era and also has given the Chickahominy an idea of what their ancestors looked like through the creation of a pair of CSI-style facial reconstructions. "Professor Barka's goal was to find settlements dating to the Colonial era that would help us understand the interactions between the colonists and the Chickahominy. He found an amazing array of evidence for Chickahominy life," Gallivan said. "He found houses and burials. He found evidence of pottery and stone tools, trade goods—really the whole gamut of social life dating from AD 600 through the early 17th century." So much came out of the ground that analysis of the Chickahominy River Survey extended over a number of years, ending in 2009. Shortly after he arrived at William & Mary, Gallivan began working with Barka on the Chickahominy artifacts. Their working group expanded to include Danielle Moretti-Langholtz, director of William & Mary's American Indian Resource Center, and Michael Blakey, director of the Institute for Historical Biology. Most importantly, the working group included the Chickahominy people, who still live near where their ancestors lived for a millennium or so. "I went with Danielle and Michael to the tribal council in order to give them the history of this project," Gallivan said. "We asked them to work collaboratively with us on this next step, which involved an inventory and reporting of the artifacts." William & Mary's archaeologists have developed a reputation for sensitivity in working with descendant communities associated with archaeological artifacts, human remains in particular. Accordingly, Gallivan said, the Chickahominy were asked to make the decision about the disposition of the remains recovered by Barka. The Chickahominy decided, after much thought, to approve the continued scholarship on the remains. "It was a hard decision to make because those remains are somebody's loved one: Would I want someone to disturb my mom's remains?" Chickahominy Chief Stephen R. Adkins recalled at a March 16 ceremony in the Great Hall of the Wren to commemorate the conclusion of the Chickahominy River Survey. "But we thought we would be remiss if we didn't do some work with these remains that would help point us to a better place in the future. The College was 100 percent supportive. If we would have said no, the project would have stopped. But we thought that was the right thing to do." Once the decision was made, the Chickahominy tribal council appointed Assistant Chief Wayne Adkins as liaison for the tribe to assist in the analysis of Barka's findings. After the final set of reports was completed in 2009, the archaeologists and the Chickahominy began discussing what should be done with the artifacts, particularly the human remains. Gallivan said he assumed that the tribe would want to re-inter the remains of their ancestors. "But the tribe said to us, 'Well, we are really fascinated by this, what else can we do?'" Gallivan said. "And my question to the tribal council was, 'Well, what are you folks particularly interested in?'" The Chickahominy were interested in two things. First, the stone-ground corn people of today were curious about what their ancestors actually ate. Secondly, Gallivan said, a number of the Chickahominy had always wondered what their forebears looked like. The tribal council and the anthropology department at William & Mary jointly submitted a successful proposal to the Virginia Department of Historical Resources for funding to address both questions. The anthropologists used bone chemistry to study the isotopic signature of the Chickahominy remains over the centuries to determine if the coarse-ground corn people had a diet to match their name. Gallivan explains that corn (and certain other foods) leave a chemical signature in bones through residual isotopes of carbon and nitrogen. "If someone years from now examined our remains, they'd see a lot of corn, too," Gallivan said. "But that's because corn has become the keystone species of today's industrialized food system." Analysis of stable isotopes added much context to the Chickahominy story, he said. "Corn, or maize, was introduced in the twelfth century A.D.," Gallivan said. "We have some skeletal remains that predate that period, and the bone chemistry lacks the high carbon isotope values that you associate with maize consumption." The Chickahominy did not live by maize alone. The bone chemistry reveals other major elements of the diet that included wild plants, fish and game animals such as deer and raccoons. Then, in the 1500s, the bone chemistry reveals a dramatic increase in the importance of maize in the Chickahominy diet. "This change occurred prior to the Colonial era, so this transition wasn't introduced by Jamestown colonists or other Europeans on the scene," Gallivan said. "We suspect the transition to a greater reliance on maize was the result of political changes that happened in Virginia before the colonial era." Gallivan is using his research leave to literally write the book on the social, political and religious life in Virginia over the centuries before the Jamestown colonists arrived in 1607. At that time, the political seat of power—and the closely related seat of religious authority—was at Werowocomoco, over on the north shore of the York River. At Werowocomoco, Chief Powhatan exercised sovereignty over virtually all the tribes in a region that extended from the Eastern Shore to the fall line, near where I-95 is today. The Chickahominy were an exception. Gallivan said the tribe was independent of Powhatan's rule in the Colonial era; their autonomy from Werowocomoco probably goes back a century or so before Europeans arrived. The bone chemistry and Barka's archaeological survey hint at an economic basis for Chickahominy autonomy: the fertile Chickahominy drainage likely served as the region's maize basket during an era in which the natives were transitioning from hunter-gather lifestyles to more settled communities linked by trade. "By the 16th century, I believe the Chickahominy are producing surplus amounts of corn and trading it to other groups," Gallivan said. "That's certainly the role they're playing in the early 17th century, when their extra corn was going to the Jamestown colonists." Gallivan points out that the Chickahominy were different from their fellow Algonquian neighbors in other respects. There's a sense, he says, that the Chickahominy were recognized as an older and more venerable culture by their fellow Algonquin neighbors. Their pottery is subtly distinctive from that produced by other tribes. The tribe also maintained a different form of government—all Indians and no chiefs. "They were led by a council of priests or elders, a very different way of making decisions than that found in the Powhatan chiefdom, where political, religious and economic authority were centralized in the hands of one person," Gallivan said. The Chickahominy were respected for more than their culture and government. "The Chickahominy were known to be populous and warlike," Gallivan said. "They were tough guys. And they remain so today."